Whether you want meat sauce or marinara, velvety vodka sauce or Tony’s special tomato sauce, it all tastes homemade—from a very fine home. Photo by Trutenka | IST. 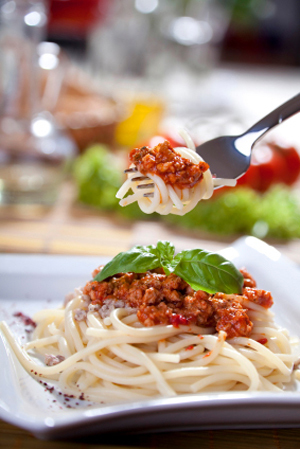 WHAT IT IS: “Homemade” pasta sauces from the recipes of a family-run Italian restaurant. WHY WE LOVE IT: Great flavor with zero added sugar or salt. All sauces should be like this! WHERE TO BUY IT: TonyBoffasSpecialtyFoods.com. CAPSULE REPORT: The label design on Tony Boffa’s line of pasta sauces isn’t pretty by modern standards. It looks circa 1951, when the first Antonio Boffa founded his restaurant in Middletown, New York. And that’s how good the sauce is: recipes from an Italian heritage, where flavor comes from the best ingredients, with no added sugar (the Vodka Sauce adds an indiscernible amount of honey). Two of the four varieties have no salt. This is tomato sauce as it should be. Marinara Sauce, the classic with basil and garlic. Meat Sauce, with lots of ground beef and pork sausage. Tomato Sauce, flavored with beef and pork fat. Vodka Sauce, done to creamy perfection and alas, given the higher calorie and fat count, our favorite. We taste a lot of sauces each year; few get to be Top Picks Of The Week. Tony Boffa is welcome in our home (and office) anytime. Retailers: Welcome him to your shelves! And make sure not to run out of the Vodka Sauce. Six jars (the standard website order) makes a great Father’s Day gift. Read the full review below. It includes more than 30 ways to use these sauces beyond topping your pasta—although topping pasta is a great way to start. Find reviews of more of our favorite pastas and sauces. Artisanal Italian Pastas. Pastas so stunning to look at, you won’t even want to cover them with sauce. Read the review. Nuovo Pasta. 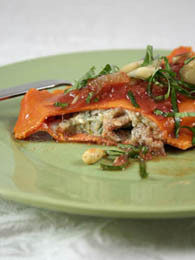 Our favorite ravioli, filled with duck, lobster, osso bucco, short ribs and other gourmet delights. Read the review. 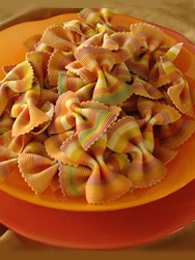 Rossi Pasta. 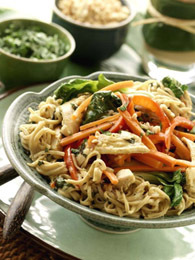 Lovers of flavored pastas will have lots of fun here, with flavors and recipes that span the world. Read the review. others in on the fun. May Is National Burger Month. Fire up the grill: Here’s a different burger concept for every day of the month. Antonio Boffa emigrated from Italy in 1947. In 1951 he opened the doors of a modest Italian restaurant in quiet Middletown, New York, which he still runs with his son Tony. 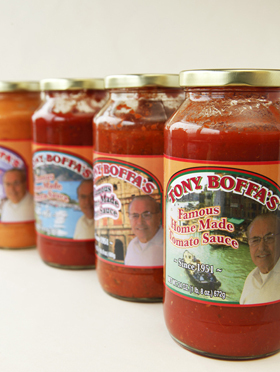 Over the years, many customers have asked to purchase the Boffas’ sauces, but it took the third generation—grandson Tom—to make it happen. Young Tom Boffa wanted a career in the food industry, but sought a horizon beyond the family restaurant. Marketing the family’s in-demand tomato sauce seemed like an option. A business student at Misercordia University in Pennsylvania, he spoke with a professor and got internship credit for putting a pilot program together, along with classmate Dustin Watts. A smiling Tony superimposed upon Venice’s Grand Canal may seem schmaltzy, but we forgive the label design because Tony’s tomato sauces are super. Photo by Katharine Pollak | THE NIBBLE. The internship has concluded and Tom and Dustin have jumped the gun on finding a job after graduation. The two have created their own company, Tony Boffa Specialty Foods. Still students, they now sell the sauce to retailers. They’ll even be on QVC this summer. Antonio and Tony Boffa prepare the sauce at a USDA-certified food packaging plant in New York’s Hudson Valley, near the restaurant. Tom Boffa and Dustin Watts sell the sauce when not working at their studies. Tom has said that the key to selling the sauce to retailers is sampling the product: Nine times out of 10 they like it. We’ve got to ask: What’s wrong with that tenth person? Join us on the next page to see the more than 30 things we’ve done with the four sauces.